With Argentina in peril of missing a World Cup berth for the first time since 1970, Holland third in their group and with both Portugal and Italy almost set to face a play-off, you can’t underestimate England’s performance as the Three Lions have been able to gain the access to 2018 World Cup through an unbeaten run into their qualification campaign. So, with the qualification under his belt, England gaffer Gareth Southgate has enough time to spend thinking about who to call-up into the squad for the World Cup and about what areas he could improve to made England able to perform in Russia better than they did during last tournaments. And one thing Southgate should think about is the use of a three-man back line. In fact, England’s arguably best performance under Southgate came against Germany last March when the coach experimented a back three with some degree of success. Gary Cahill, Chris Smalling and Michael Keane started over there behind two holding midfielders, while the width has been provided by a couple of energetic from full-backs. Southgate repeated the experiment in the final minutes against Slovenia but the question here is if it represents a tactic to be resorted on a permanent basis by the England manager. Five at the back against Slovenia. As every tactic in football, a three-man defence too has pros and cons. Surely, this defensive system could allow England to be more ruthless and could make them dangerous on the break which could help against ball-possession sides such as Germany or Spain. From a defensive point of view, a three-man backline could also help England’s goalkeeper. That would not be bad for a team that has a question about who should be the starting netminder. Joe Hart is currently England’s No 1 but, despite he’s one of the most capped English goalkeepers, is far from a sure thing. Shut down by Pep Guardiola at City and following a not impressive spell to Torino, where he allowed 62 goals in 36 league games, Hart went back in England to play between West Ham’s posts where he had been not so outstanding. The 30-year-old keeper knows he needs a strong campaign to claim a starting spot England next summer and the competition will be tough. Whoever will be the No.1 in Russia, providing him three centre-backs could help England’s defensive phase. 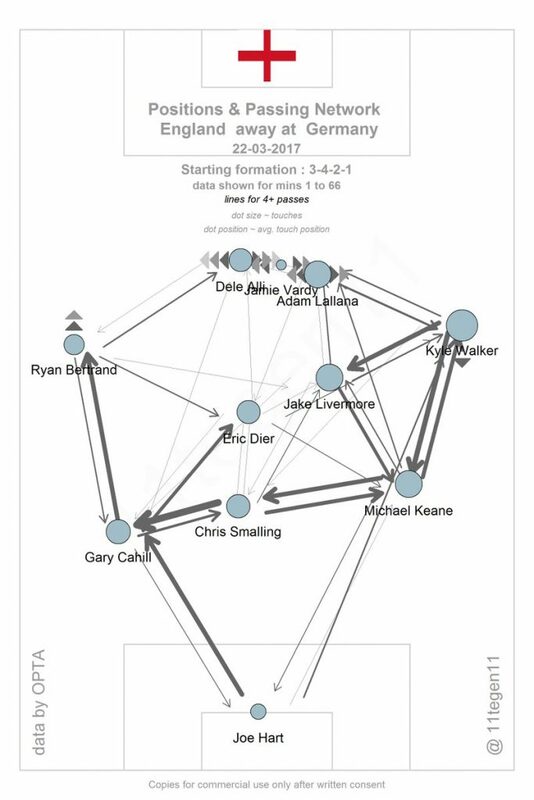 The 3-4-3 system Southgate employed against Germany worked really well, and some variants – as 3-5-2 or a more offensive 3-4-2-1 could work as well. In the below pass map provided by the great @11tegen11, you can appreciate how a three at back formation helped England’s ball circulation against Germany. In fact, Southgate’s side has been able to move the ball through the centre-backs and the wing-backs but also between the five at the back and the players up front. England played with a three-man backline also in their 1-0 win in Lithuania that ended their qualifying campaign. In Vilnius, Southgate lined up a backline featuring John Stones, Michael Keane and the rookie Harry Maguire. And ball circulation still has been decent – although not optimal – as Southgate’s side produced 20 attempts. 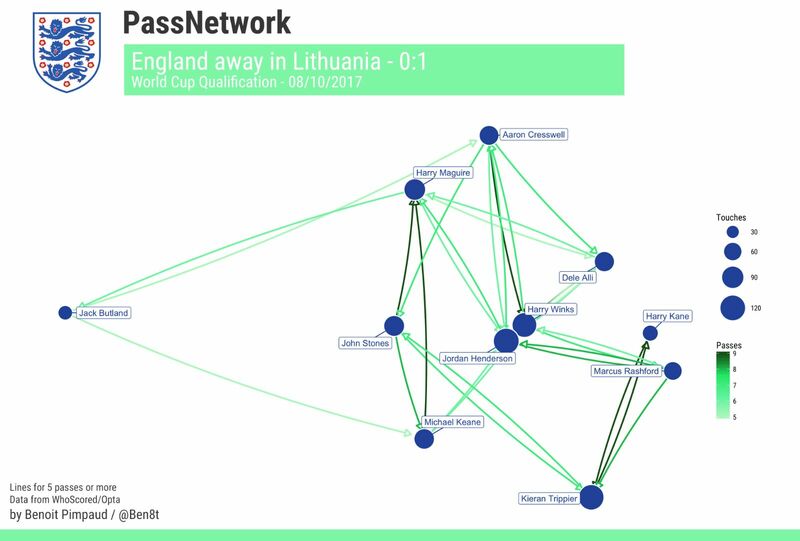 Benoit Pimpaud kindly provided us England’s pass map against Lithuania. Despite the fact England didn’t play a three-man defence since their loss to Croatia in 2006, three at the back is not strange to English football as formations with this kind of backline have been lined up latest seasons in Premier League. Several sides used this defensive shape, notably Chelsea and Manchester City but Liverpool and Tottenham too under Mauricio Pochettino employed that at times. Players as the aforementioned Cahill, Smalling or Keane and also as John Stones all could benefit from having a spare man at their back, being them not so quick. Should Southgate deploy a 3-2 shape at the back – with 3 centre-backs and 2 holding midfielders – England could take the advantage of using 2 defensive midfielders to manipulate rivals’ second line. That can happen as the 2 holding midfielders can occupy the middle of the pitch behind the opponent first line of pressure in order to help the 3 centre-backs to get the ball out from the back. It also helps the backs to gain easier access to the half-spaces favouring the progression of the ball through being a three at the back that rare system allowing centre-back to push high up. Cahill generates numerical superiority moving through his centre-half. Should they not find a vertical passing line, then the outside centre-backs still can exploit wider routes through the wing-backs in the way to maintain ball control. It means that, with England’s backline under pressure, the three at the back could easily find an outside free-man to progress the ball through. In opening passing lanes towards the wider areas, they could gain depth. That said, shouldn’t Southgate want put emphasis on the flanks, they still could play a direct ball through the third line with central-midfielders and forwards moving higher up to play the second ball. Also, within a 3-4-3, 3-5-2 or 3-4-2-1 system, diagonal passes from centre-half to centre-half or towards the far side are easy to build so England could put emphasis on switching play. The outside backs can also step higher the pitch behind the first line of pressure, creating the free-man in the middle of the field. On the defensive side, the cooperation between the defensive midfielders and the backs has to be efficient, especially between holders and wing-backs. Otherwise, opponents could exploit the spaces at the back of the wing-backs – the true weakness of three-man backline – getting the outside centre-backs isolated in wider areas and generating structural issues. The wing-backs also have to be good enough to provide a link between the backs and the midfield and have to avoid dropping too deep or they could be easily closed down on the flanks. Basically, the wing-backs have to decide when defending deep and when defend narrow, helping the central midfielders. In Kyle Walker, Southgate has a full-back/wing-back which looks able to do it. Having three at the back also has a positive effect when out of possession, as it allows a great central protection. Adding a couple of wing-backs could guarantee England a great width protection too. Against ball-oriented sides, England could operate in a 5-3-2/5-4-1 shape having the control of both depth and width. It also could allow Southgate to provide his team with a better aerial presence in the box to defend against crosses. Teams suited to switch play also could face issues trying to find open gaps into a defensive line with five active defenders covering width. The five at the back defensive shape means the defence can cover depth and width while defenders can also maintain the right distances between themselves. This also allows a team to make the ball-close wing-back free to defend wider and higher as the depth is covered by four other teammates. Moreover, English backs – which are not well-known for their tactical acumen – could play with more freedom, relying more on their physical skills rather than on their tactical knowledge. In fact, the Englishmen could rely on a safety net at their back that would allow defenders to play more aggressively. Furthermore, this five-man backline allows the ball-near backs to mark their opponent even if the opponent should decide to come back deeply in his territory trying to receive the ball in between the lines. This could allow Southgate to be able to build an efficient defensive wall in the middle, making England tough to be penetrated in central zones. “It helps to be able to switch between two systems but, for me, that would both be with three at the back,” Southgate told reporters. A player as Cahill has successfully played in this system at Chelsea for Antonio Conte, while Stones could push up more acting as a free man in the midfield with England in possession. Furthermore, Southgate could deploy a system more suited to exploit the skills of players such as Adam Lallana or Marcus Rashford, making them more free to play into more advanced positions to support Harry Kane. The three at the back experiment already started and Southgate has now some months to make it ready for the Russian trip.